Lanvin's ivory sheer silk-chiffon blouse is an elegant choice for a modern bride, with pearl button fastenings and crepe tuxedo-style front. 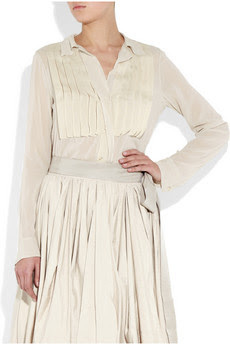 Pair this blouse with a full skirt and ruche up the sleeves for a sophisticated city nuptials. 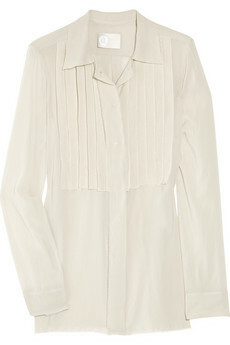 Blouse has long sleeves with pearl button-fastening collar cuff. decorated with a pleat which is folded over the back and edges. Made from 95% silk and 5% elastane. Specialist clean.